Manufacturing workers are, increasingly, “leaving for work far before the sun rises and getting home long after it has set.” So says this article from mlive.com describing the harsh reality of the shortage of skilled workers. Lacking labor, companies must make “multiple changes across the board,” the article continues. Executives from two tool and die companies are quoted—here’s the article. The fifth edition of The MFG Meeting, March 4-7, 2015, will bring together the manufacturing community to learn, network and be inspired. This year’s meeting will focus on the power of manufacturing, which is driven by innovation, design, insight and people. The presentations from industry leaders will provide creative ways to optimize the drivers of manufacturing and provide solutions to strengthen your business. One way to address manufacturing’s skill shortage is to engage our youth. That’s exactly what the folks at Assabet Valley (MA) Regional Technical (AVRT) High School had in mind when they decided to mentor their local Southborough Boy Scout Troop 1 and help the boys earn their welding merit badges. Earlier this month, more than 20 AVRT students braved a New England snow storm to spend 9 hr. teaching the scouts how to safely operate oxyfuel and gas-metal-arc-welding torches. Here’s a photo gallery showing the boys cutting ½-in. plate and welding in various positions. Surf on over to this webpage to witness how metal fabrication can look like magic. Watch as hot-rod builder Tom Hanna takes us on a photographic journey that records every step along the way to forming aluminum sheets into what looks like a one-piece stamped body. Watch it here: A high-volume fastener installation system can set two-and-a-half times the amount of fasteners in-die in the time it takes an orbital riveting system to set one fastener. 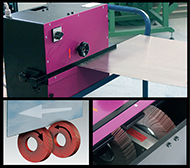 This eliminates secondary operations, resulting in lower costs. 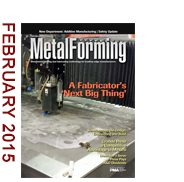 Get MetalForming Everywhere! MetalForming magazine is proud to announce the launch of its new mobile app, MetalForming Everywhere! The app features up-to-the-minute industry news and new-product introductions, Twitter updates, access to MetalForming magazine articles, and the ability to register for magazine events right from your smart phone or tablet. The MetalForming Everywhere app is available for download through the Apple AppStore and Google Play. Here’s a testament to simultaneous stamping-die design and development, where CAD/CAM software integrates the diemaking process from quote to delivery. The result: improved quote hit rates, slashed lead times, reduced costs and optimized quality. Supplier Tooling Engineer - Automotive (IL) / Martin Management Inc.